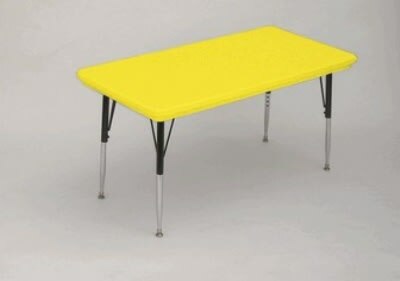 Blow-Molded Plastic Top Activity Table is free-standing, full perimeter welded steel frame. The top resists stains and damage from food, juices, crayons, paint and even permanent markers. Tops are light weight, scratch and impact resistant. Legs attach to frame with 3 bolts each (socket wrench required). Short legs adjust from 16" to 25". 30" x 60". Yellow.